Excerpt: The last several years have been busy and exciting for researchers at McCrone Research Institute. They have been developing a series of microcrystal tests that forensic scientists can use with light microscopy to accurately identify trace amounts of illicit narcotics and diverted prescription drugs in the crime laboratory. The advantage of these microcrystal tests is that they use a chemical reagent to reveal the distinctive morphology and optical properties of crystals from a small sample of suspected drug substance. From these characteristics, a researcher can more easily identify most drugs of interest. The tests also require only a minute sample and are sensitive, fast and specific. Abstract: Microcrystal tests are used as analytical techniques for distinguishing certain drugs in the forensic sciences. While there are some drugs, such as cocaine and heroin, with validated microcrystal tests, other classes of drugs, e.g. the benzodiazepines, lack such microcrystal tests. The goal of this research is to optically characterize and develop a microcrystal test that could be used to detect clonazepam. Clonazepam is a benzodiazepine drug that is sold under the trade name Klonopin. It is known for its sedative-hypnotic properties and has therapeutic uses as an anticonvulsant and anxiolytic. Benzodiazepines have been abused for these sedative effects and are known for their use in drug-facilitated sexual assaults. A microcrystal test was developed that is able to detect clonazepam in pharmaceutical preparations at all current dosages. The test involves the dissolution of microgram quantities of clonazepam in acetone or chloroform and the addition of a 10% platinum chloride aqueous solution. The presence of clonazepam is indicated by the formation of rosettes made of colorless, blunt-ended rods. No other drug is known to exhibit the same reaction with these reagents, making this microcrystal test a viable option in forensic analyses. James R. Millette, Ph.D., D-IBFES and Steven Compton, Ph.D.
Abstract: There is general agreement that a negative finding using the usual bulk microscope analysis for building materials without any pre-treatment of the vermiculite is not reliable. Preparation procedures involving sedimentation, grinding and total matrix reduction with acid/base dissolution have been used to improve the ability to find asbestos if present in vermiculite ores and products. This article contains information on most of the available methods for vermiculite analysis based on an extensive review of published articles, government reports and other documents. The limited data in the published articles concerning the major vermiculite sources in the Enoree district in South Carolina; Louisa County, Virginia; Palabora, South Africa; and Xinjiang Province in China strongly suggest that commercially available non-Libby vermiculite is not contaminated with amphibole asbestos to the extent of the vermiculite from Libby, Montana. Differentiating Libby vermiculite insulation from other commercial sources can be done reliably and inexpensively with a routine chemical barium test as long as the insulation sample is not a mixture of Libby vermiculite and other materials. A qualitative transmission electron microscopy (TEM) analysis of a filtration of the fibers suspended in water from a sample of vermiculite attic insulation (VAI) that was prepared using the sedimentation procedure appears to be a reliable method of confirming Libby vermiculite. Excerpt: Forensic science may be high-flying on television, but down here in the laboratory it is in crisis. Today’s forensic services are fighting for funds, tormented by fraud, tainted by official reports of incompetence and dishonesty, while its great experts are retiring only to be replaced by goal-oriented technocrats. … In the world of American law enforcement, the aim to find out the truth has been subsumed by an overriding desire for the police to allocate the responsibility to somebody. Anybody. The theme is pinning blame, not uncovering facts; and the forensic experts will be at a junior level — indeed, unless you work for the FBI, they will be asked for an opinion only if they’re cheap enough. Originally published in The Microscope, Vol. 23, Second Quarter, 1975. 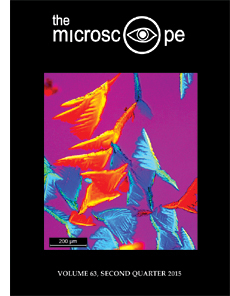 Excerpt: A schlieren, or dispersion staining, microscope operates by blocking out the zero-order rays where they form an image of the light source. Index of refraction gradients or thickness variations in the sample then deviate some of these zero-order rays, causing them to contribute to the illumination at the image plane (1). The image of the light source is normally found at the back focal plane of the objective. This is an awkward place to insert diaphragms, etc. Nevertheless, commercial dispersion staining objectives of moderate N.A. are available. High N.A. objectives cannot easily be adapted to dispersion staining because the back focal plane of these objectives is well inside the glass. This is an unfortunate limitation to an otherwise powerful method of particle identification since it denies the full resolution range of the instrument to the user. Excerpt: Zeiss has introduced a new generation of field emission scanning electron microscopes (FE-SEMs) with enhanced Gemini technology for research, industrial labs and imaging facilities. The proven Gemini design combines electrostatic and magnetic fields, and exemplifies efficient detection, high resolution and ease-of-use. 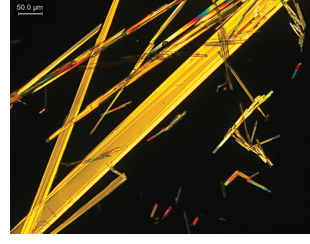 This image shows the results of a microcrystal test for the drug d-amphetamine using gold chloride in a phosphoric acid reagent. The test was performed by placing 2 PPP (approximately 0.2 mg) of d-amphetamine on a microscope slide with 10 ÂµL of 40% sodium hydroxide. 5 ÂµL of reagent was then deposited on a coverslip, which was inverted over a glass-ring reaction chamber. These crystals formed after the hanging drop was allowed to sit for 15 minutes; it was then turned over and exposed to air. (Photo courtesy of McCrone Research Institute). Copyright © 2015 Microscope Publications, Division of McCrone Research Institute. All rights reserved.